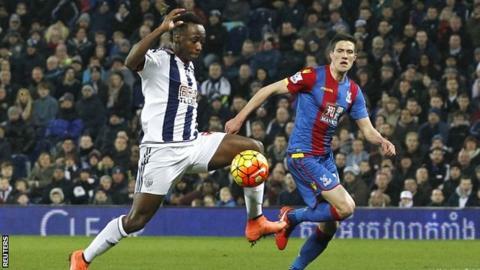 Striker Saido Berahino is as important to West Brom as Harry Kane is to Tottenham or Jamie Vardy to Leicester, says Baggies boss Tony Pulis. Berahino, who apologised on Friday for threatening to go on strike, scored the third in a 3-2 win over Crystal Palace. It was the 22-year-old's first goal in the Premier League since October. "If you take Kane out of Tottenham's team or Vardy out of Leicester's, they leave massive holes. Saido is as good for us as they are," Pulis said. "When Saido and Salomon Rondon, play together they are handful and we haven't had that for half a season." How do they compare this season? Following his threat not to play for the Baggies again under chairman Jeremy Peace after a potential move to Spurs fell through, Berahino spent three-and-a-half months out of the starting line-up, returning to the first-team last weekend in the win at Everton. And, after early goals by Craig Gardner and Craig Dawson, his effort proved the difference as he superbly volleyed in Stephane Sessegnon's diagonal ball before Connor Wickham's double hauled Palace back into the match. Berahino, who has scored three times in the FA Cup since the new year, also hit the bar while the score was 3-1. After a seventh goal of the season, Berahino said his link-up play with fellow striker Rondon had played a key part in the victory. "We've been working hard at trying to link up, today we clicked and it's a good sign," he said. "I've been through a lot this season but I've put the past behind me. I was just out there enjoying myself. You just want to go out and show what you're about." The game against Palace also saw the club rally around Chris Brunt, who was struck by a coin thrown from a Baggies fan in the loss to Reading last weekend. Supporters collected money for a charity of the Northern Irish international's choosing and sang his name during the 11th minute of the match to correspond with his shirt number. Unfortunately for Brunt, he had to be taken off just before half-time with what looked like a serious knee injury, but Pulis said the whole episode had brought the club together. "If the supporters want to boo and moan, they have a right to, the players accept that," Pulis said. "But you can't accept throwing stuff at players. "It's a wonderful football club, and [the incident] most probably brought fans all together to support the team and the club. They think the world of it." On Brunt's injury, Pulis added: "It's a disappointment for us because he's a good player. He could be out for a while."